Home / Canine Services International Dog Training Blog / Believe in your dog. 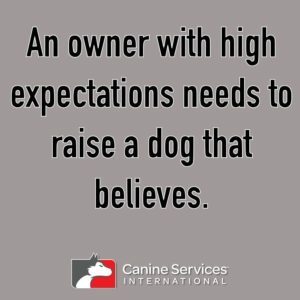 As a dog owner, you have an expectation of the way your dog will behave – the things he will do, and the things he won’t do. When it comes to the things you don’t want your dog to do – the best way to achieve this is by focussing from day dot on training the behaviour you would prefer to see instead. If you want to raise a dog that performs, you need to raise a dog that believes. 📌He needs to believe that he can try, and fail, yet be still be successful. 📌She needs to believe that you’ll provide the answers, and the space to think and process. 📌He needs to believe that you’re on his side to help him through conflict and confusion. 📌She needs to believe that you’ll make the collaboration worth her while. 📌He needs to believe you won’t expect too much, and especially not too soon. 📌She needs to believe that her effort will be honoured. 📌He needs to believe you’re a clear communicator – predictable, instructive, patient. 📌He needs to believe that he is powerful, and that his actions are instrumental to the outcomes. If you can’t inspire your dog to believe those things, then you’ll never realise his full potential, or enjoy the fullest depth of bond that you’re capable of earning from your dog.